Brands partnering with celebrities, influencers and advocates to reach a larger and more relevant audience is not a new approach to marketing. However, where audiences are active today is continually changing forcing marketers to adapt their approach to partnering with advocates especially when it comes to connecting with teenagers online. According to Buzzfeed, 93 percent of the 13-to-18-year olds surveyed in a recent study visited YouTube once a week, while only 65 percent visited Facebook. 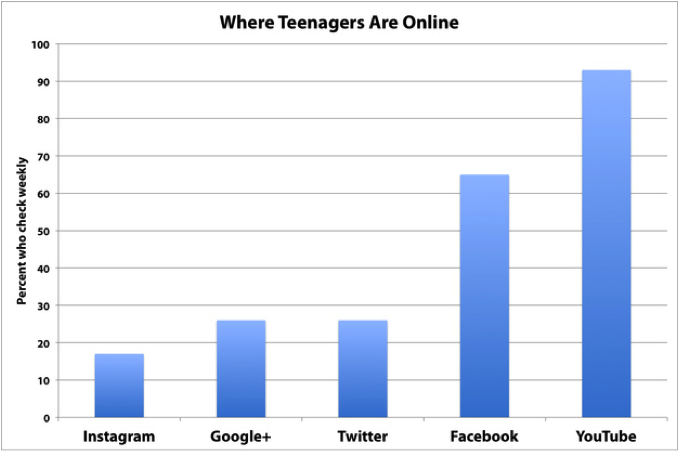 Among the other top social networks, YouTube was the channel checked the most by teenagers. Due to this growing demographic on YouTube, dozens of tween YouTube stars have risen to fame with thousands and sometimes millions of subscribers and views on their video content. Think of these YouTube influencers as the Mickey Mouse Club of our generation, except with 10 times the reach. A few brands have partnered with many of these YouTube stars already to better position their product and service offerings in front of these advocate’s massive followings. These teen YouTube stars, like iJustine, Bethany Mota, the Janoskians, Hunter March and others, create content on a daily, weekly or monthly basis that resonates with teen audiences across subject areas covering everything from gaming to beauty. These YouTube celebrities often have a large and loyal following on other social channels as well like Twitter, Vine, Instagram, Facebook and elsewhere that help drive further traffic to their YouTube channels with each new video they upload. If you’re looking to reach a younger audience in an organic way where they are most active, partnering with a YouTube star relevant to your company’s target demographics may not be a bad idea. 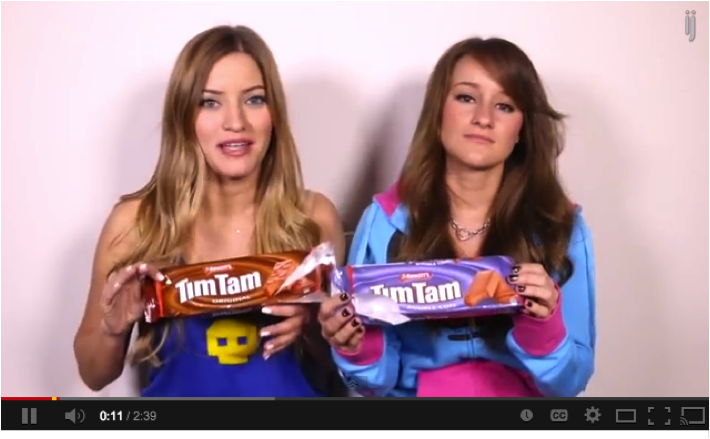 Here’s how other brands have initiated partnerships with YouTube stars in the past and what you can learn from their efforts. When partnering with a YouTube star, one of the goals is for that online celebrity to create content about your brand and its offerings for their audience. This can come in many forms, but ideally this user-generated content should be genuine when it comes to the incorporation of your company in these videos. Taco Bell executed this type of partnership effectively when working with YouTube star FreddieW on a FieryDLT commercial for his YouTube channel that gained over 1 million views. 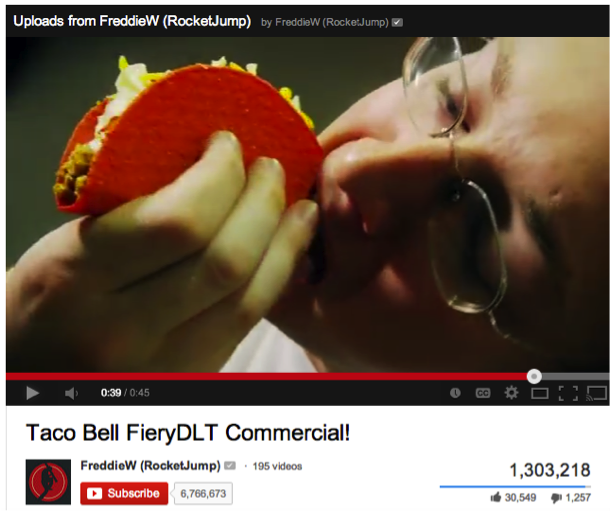 The video starts with Freddie explaining that the video was in fact commissioned by Taco Bell and to possibly look out for it on TV in addition to YouTube. This channel typically shares videos about video games and sports, perfectly matched with an audience interested in fast food. The video was created in a similar quality to the other videos regularly uploaded to the channel with a few visual enhancements from the help of Taco Bell, which helped make the video both organic and relatable, while adding an extra visual moment that made the video stand out. It appears that Taco Bell helped work on what the video would specifically be about, helping direct its message. Emulate this approach with other YouTube stars to increase the amount of user-generated content being regularly created about your brand online. In some cases, scripting the direction of the video can help control the message sent to viewers as long as its inline with the YouTube stars typical voice. Other brands have taken the less scripted route with their advocate partnerships, inviting YouTube influencers to their events to capture what’s happening at these events across their YouTube and other social media channels as they see fit. For the 2013 Video Music Awards, MTV invited multiple tween influencers from YouTube, Vine and elsewhere to interview celebrities and record their experience on the red carpet. YouTube star Anthony Quintal was one of these attendees who shared his experiences in a video that saw over 500,000 views. The video was Anthony’s retelling of his evening at the event in the typical format in which he creates YouTube videos to his subscribers. In a sense, it was an organic commercial about his experience with MTV celebrities and attendees at the awards shows. Invite select YouTube celebrities to your next event to document their experience and share what’s happening behind the scenes with their audiences. For the cost of their attendance, travel and hotel accommodations, your brand can help spur the creation of user-generated content that can be seen by thousands and sometimes millions of relevant teenagers days and weeks after the event about your event but most importantly, about your business. The most engaging type of advocate partnerships are those that not only involve a YouTube star, but involves their audience to participate in a branded contest. Host a contest on behalf of your business that requires participants to enter by creating and uploading a specific YouTube video or other form of content on Twitter, Facebook or elsewhere across social media. 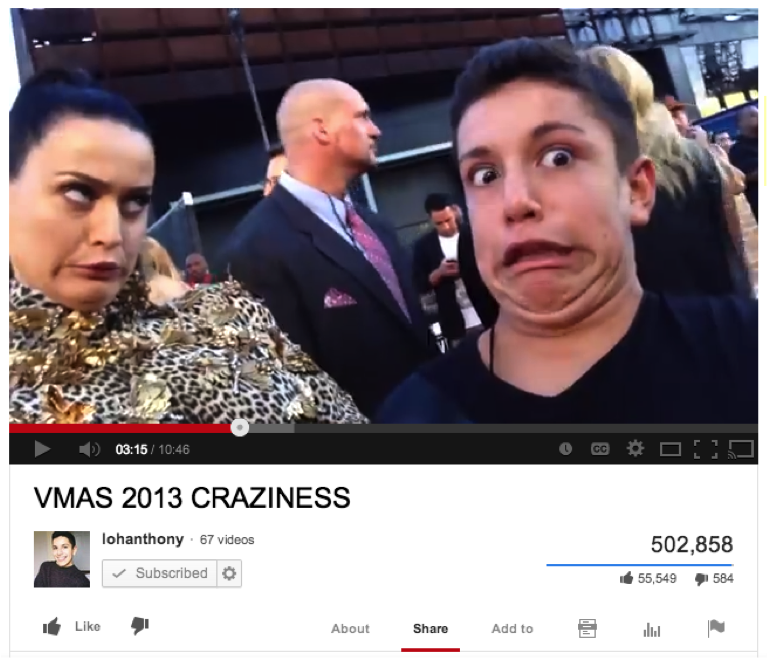 A tween YouTube star is an effective way of gaining visibility for a contest amongst the teen demographic. YouTube star Blair Fowler has been a longtime fan of L’Oreal mascara, often referencing it in her beauty tutorials and other videos throughout the years. 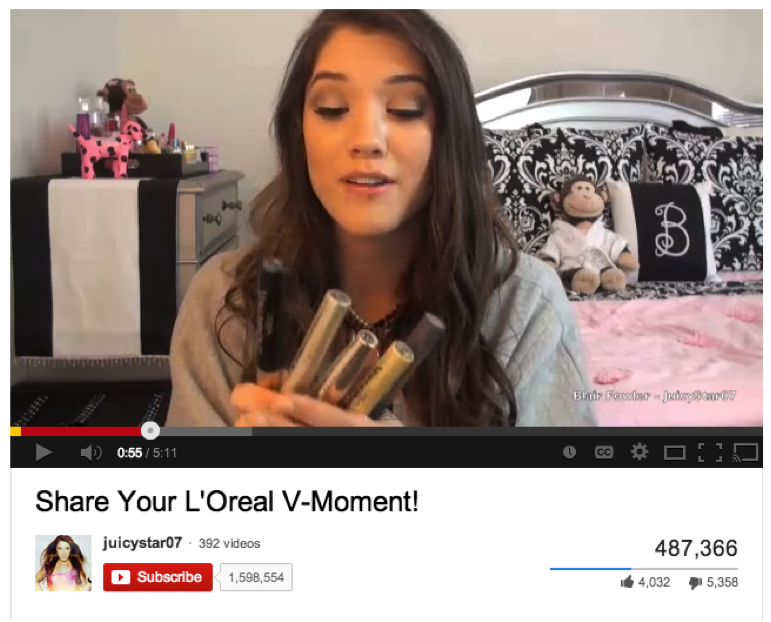 L’Oreal approached Blair to create a video about the contest they were hosting as a means of driving more engagement to their promotional contest from her vast audience of teenage girls. As part of the contest, participants had to share a special memory involving L’Oreal’s Voluminous Mascara or what they referred to as a “V-moment.” If chosen, a winner will be featured in a masthead ad on YouTube Canada’s homepage and on the brand’s YouTube channel for a day with the hopes of making that winner a YouTube star. This engages viewers past simply viewing a video with the mention of a brand, but encourages them to participate in creating content about the brand as well. When launching your own contest supported by a YouTube star, focus on the details of how participants will use a YouTube video to enter, as well as what the prize will be for the winner or winners. Both factors of the contest must relate to the interests and topics typically covered by the YouTube star to ensure there’s a match. In this instance with L’Oreal and Fowler, she already had a passion for their brand and products, which made it an authentic partnership between the star and the makeup brand. Look to work with YouTube stars genuinely interested in your brand to help support your contents and partnerships for the long-term. The trickiest option to navigate for your brand is creating your own YouTube stars through an original branded video series. This is by far the most difficult and expensive option to pursue, but if done right, could reap long-term benefits for your business. A Web series can feature your business as much or as little as your company sees fit, as long as it isn’t distracting from the subject of the videos. Kmart, in partnership with Alloy Digital, attempted its very own video series on YouTube known as First Day, featuring popular Internet star Molly McAleer. The series was aimed at teenage girls, similar to the successful series “Pretty Little Liars” and “Gossip Girls.” All of the cast’s clothing were items available at Kmart, which sponsored the series with hopes of creating a hit show online with a large viewership that would in turn see their various product lines regularly. The series drew 10 million views, even though it only lasted for two brief seasons. Create an original series hosted on YouTube that matches the interests of your target demographic and the ideals of your brand. Collaborate with existing YouTube stars to help draw an audience, while also using the talents of other actors and actresses that could one day become an influencer on YouTube on behalf of your brand. Incorporate your company’s unique offerings organically into this Web series to ensure you’re providing interesting content to your audience first and foremost as opposed to an infomercial about your products. Tread lightly with this approach since it’s quite difficult to predict the success of a Web series until it’s live. Experiment extensively and listen to your audience to best understand what’ll work for your business when it comes to partnering on YouTube. 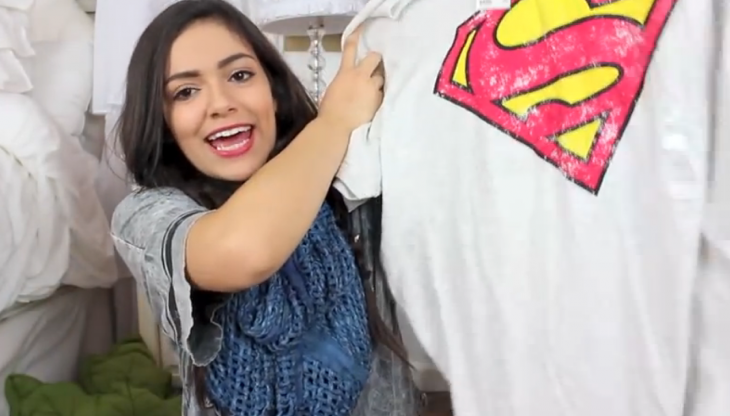 How will your brand partner with YouTube’s growing pool of tween stars? What seems like the biggest obstacle to your success working with these YouTube celebrities? Share your thoughts in the comments below.